So you’ve noticed some abusive or unhealthy behaviors in yourself and have decided you want to make a change. That’s great! You’ve already completed the first step of behavior change: acknowledging that there is a problem. Now how do you proceed from here? It can be possible for abusive partners to change, but knowing how to go about it is the key to success. If proper time isn’t taken to create an action plan, people can get stuck in unhealthy and familiar patterns. We know that overcoming abusiveness can be a decades-long process for some, and having more structure can help the process move smoother and more quickly. Let’s break down the process of changing behavior into smaller, more manageable steps. Set goals for behaviors you want to stop and start. Review the evidence of change/improvement over time. First, make a list of problem behaviors. This includes both abusive and unhealthy behaviors. The difference between abuse and unhealthy behaviors is that abuse is about power and control, and maintaining an unequal power dynamic that benefits one person more than the other. Unhealthy behaviors are those that may not have reached the level of abuse, but are still nurturing mistrust, dishonesty or inequality in the relationship. If you need help identifying things you’re doing that may be abusive or unhealthy, you can read about types of abuse and/or reach out to our advocates! Next, identify the good behaviors that you’d like to start doing and the behaviors that will replace any problematic ones. For ideas, you can read about what healthy relationships are supposed to be like. You might also look into communication, conflict resolution, trust, respecting boundaries, equality, dealing with anger, reaching a state of calm, showing respect, taking a break, practicing self-care, ensuring true consent and letting your partner take steps to make themselves emotionally and physically safe. After that, you can create a plan for how to reach these goals and maintain your new behaviors. One idea might be jotting down a bullet point list of healthy responses for every problem behavior you identified. Not only does writing help commit things to memory, but having a hard copy to refer to when you need it is a great way to redirect yourself. Another part of this step is thinking about ways to reward yourself when you make progress. Positive reinforcement is one of the best ways to make good behavior stick. This might include acknowledging yourself, making/buying your favorite food, buying yourself something, doing something special or going out somewhere, treating yourself to a relaxation activity or pampering, watching a movie or playing a video game you’ve been excited about, or even putting money into a savings account so you can watch your wealth accumulate as you make progress. You might even invite your partner to point out when you’re engaging in a problem behavior, when you’re using healthy behaviors, and if the strategies you’re trying are helping. Remember though, it’s not your partner’s responsibility to identify problem behaviors, tell you how to solve problems, or point out every healthy thing you do, and they should never feel obligated to do so. 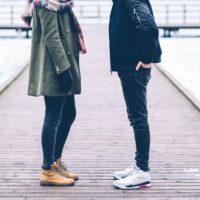 The only person responsible for your change process is you, and it’s important to consider that your partner might not feel comfortable communicating openly about your behavior at first, or even at all. Give your partner time to feel safe again and for communication to improve, and accept if your partner is ready to end things instead. Even if you’re working on changing your behavior, your partner never owes it to you to remain in a relationship they don’t want to be in. Hopefully you want to make these changes for yourself, so you can be a healthy, respectful partner to anyone you date, not just to keep your current partner in this relationship. The last steps are putting in the effort to change, following your action plan and monitoring evidence of change. Take a look at our article, Behavior Change: Evidence of Progress, to learn more! Need more support? Reach out to our advocates 24/7/365 by phone at 1-800-799-7233 or by online chat at www.thehotline.org.